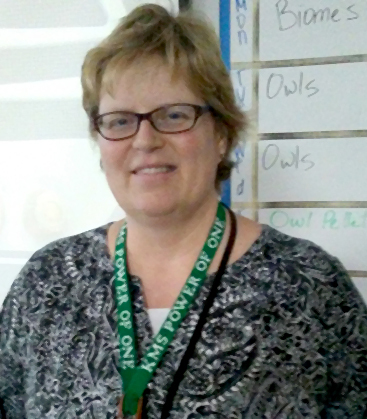 “Rio Salado has been very supportive during my first year of teaching,” said Kyrene Middle School teacher Bridget Bambling, one of 17 scholars who has completed Rio Salado’s Noyce Scholars program, which helped her re-career as a teacher. “I appreciate the feedback I have received from the instructors who have visited my classroom. I know they are there for me if I have any questions or need assistance,” said Bambling, who received her certification in May 2015 and has been teaching 7th and 8th grade science at Kyrene Middle School since last August. Bambling was a nurse for nearly 20 years before deciding to re-career as a teacher. 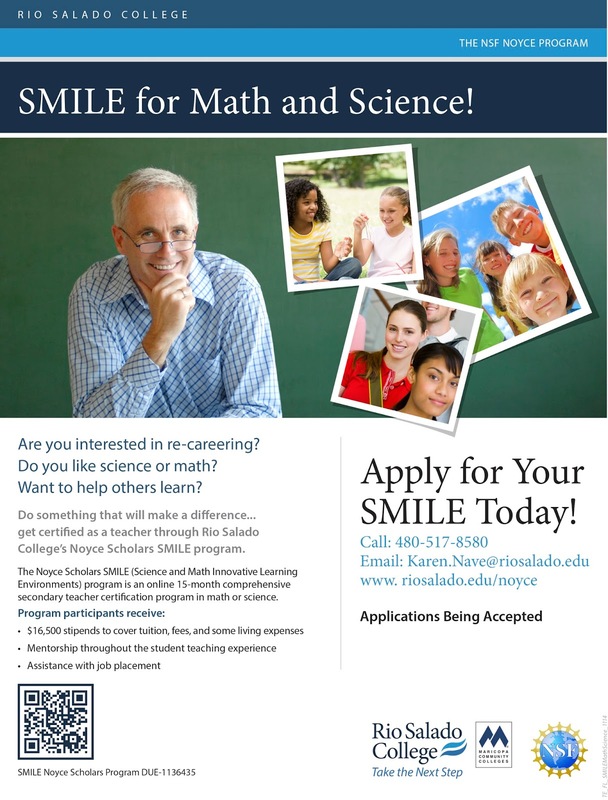 The Rio Salado Noyce Scholars fast-track teacher education program provides mentoring, assistance with job placement, first-year classroom support and a generous stipend of $16,500 from the National Science Foundation (NSF) to cover expenses. The NSF is providing funding for ten more science, technology, engineering and mathematics (STEM) professionals to re-career as secondary classroom teachers in Arizona. The 15-month, post-baccalaureate program is online, making it accessible and convenient for Valley STEM professionals who’ve been thinking about making the transition to teaching. 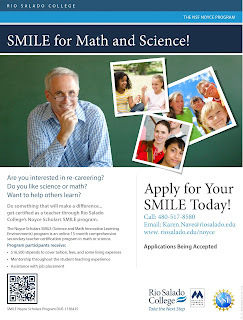 Qualified candidates will work toward a Secondary Arizona Teaching Certificate in math or science for grades 6-12 and plan to share their industry experience with students in an effort to prepare teens for high-need STEM careers-- and to help combat the severe shortage of qualified STEM teachers in the state. The deadline to apply is August 1, 2016. Candidates must have a bachelor’s degree, three or more years of experience in a non-education STEM career-- and a passion for teaching.